It’s not easy to admit you’re wrong, which is why Floyd Cardoz, of Tabla and Top Chef Masters fame, deserves major props. 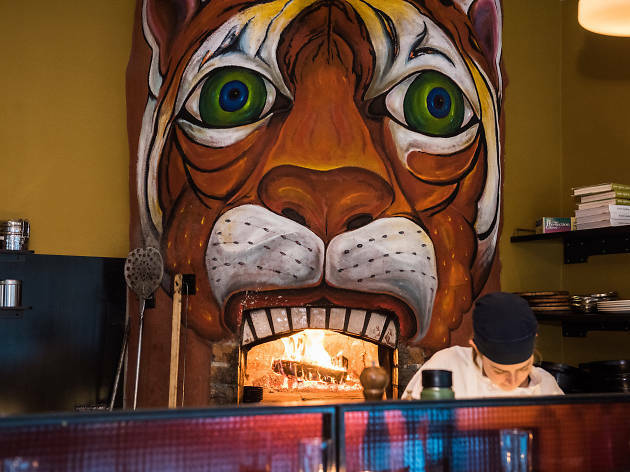 His Soho Indian spot, Paowalla, was not what he’d hoped: tasty enough, sure, but somber, subdued and irretrievably beige (actually). So he slammed the breaks, shut the doors and changed the menu. 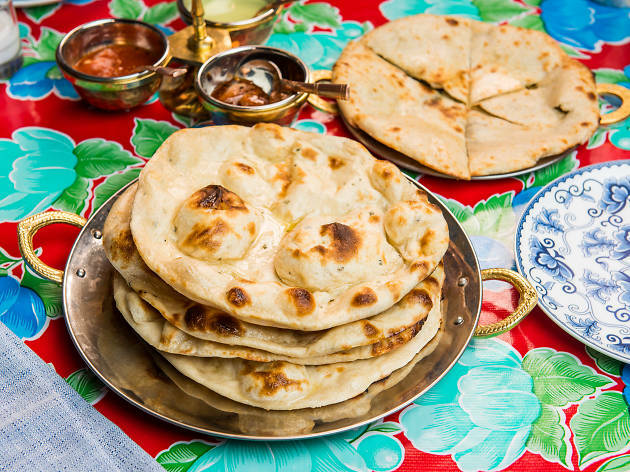 Presto chango: Welcome the Bombay Bread Bar. If Paowalla was mild-mannered Stanley Ipkiss from The Mask, the Bombay Bread Bar is his frisky, cocksure superhero alter ego. 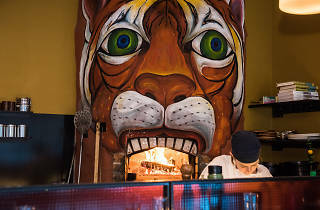 Designed by the film-set decorator and Wes Anderson collaborator Kris Moran, the space is a circus for the senses, with a massive Pop Art mural of two purple-faced Bollywood beauties, prints of dapperly dressed men with animal heads and a wood-fired oven as the mouth of a growling Bengal tiger. 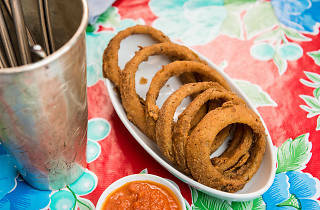 A Monday night feels like a Saturday, buzzing with the din of voracious crowds chasing crunchy, chickpea-battered onion rings or stir-fried chicken and chilies, alongside breezy Indian-themed cocktails that go down fast and easy. 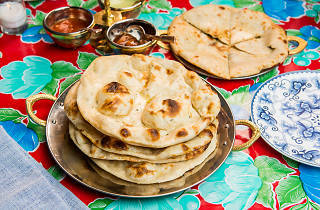 Naan is the gateway drug—puffed, buttery and pocked with char—but the kulchas, pillowy griddled flatbreads stuffed with chicken and split chickpeas or bacon and cheese, are the truly dangerous addiction. However, Cardoz, a native of Bombay, has built more than just a kingdom of carbs. 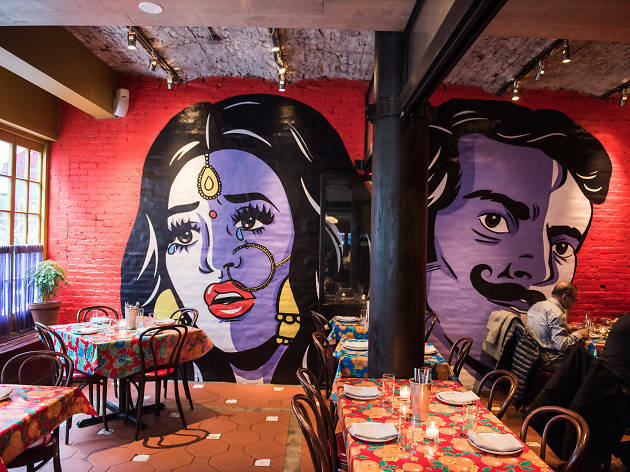 Bombay Bread Bar is the kind of colorful, rollicking spot (think Pok Pok NY circa 2012) that will reintroduce New Yorkers to Indian food through an eccentric lens. 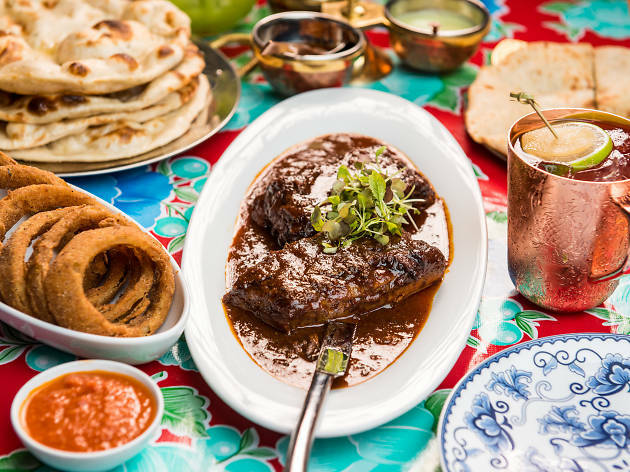 But while the spirited vibe strikes the right notes, some dishes fall a bit flat, like the tandoori octopus that cries out for some charred edges or Cardoz’s grandma’s monkfish curry that, despite being infused with coconut, coriander and chili, still feels under-seasoned. 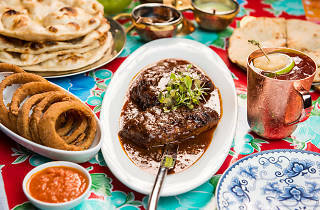 Then comes an oblong platter of pork-rib vindaloo fresh from the wood-burning oven: The meat flees the bones, and the mud-red sauce is deep with cumin and clove, gentle with vinegar and heat, and as profound as mole. 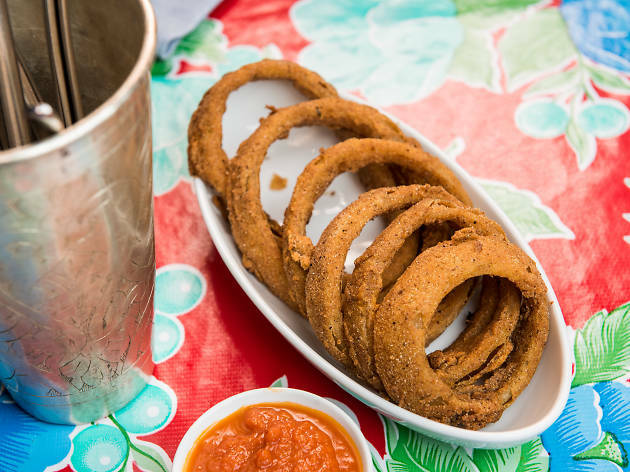 This is plate-licking food—the kind for which you overhaul your restaurant. This time around, Floyd Cardoz gets it plenty right. 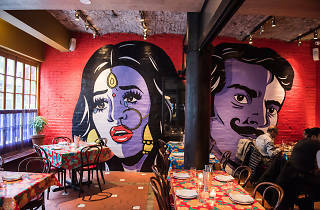 My wife and I were fans of Powalla, but we LOVE the food and vibe of the new Bombay Bread Bar. Props to Floyd Cardoz and executive chef Zia Sheikh.